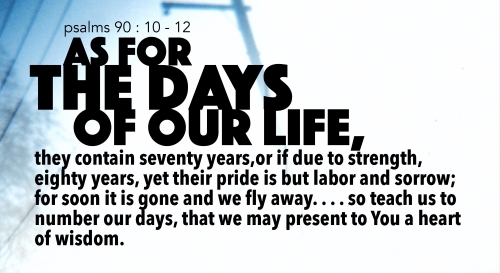 Moses in Psalm 90 asks of God to “teach us to number our days that we may get a heart of wisdom” (v. 12, ESV). The apostle Paul also wrote, “Look carefully then how you walk, not as unwise but as wise, making the best use of the time, because the days are evil.” (Ephesians 5:15-16, ESV). We are to honour God through the wise use of every moment He has given us. “I reached a point in my life when I realized two-thirds of my life had passed,” said T.C. Chua, an EAST alumnus (MDiv, 2017), “and I needed to ‘number my days’ in the remaining third of my life.” So at the age of 55, the former banking executive came into full-time theological studies. “Now when I minister and teach, for example, in India at a Bible School, I have more to contribute, ” he said. David, a Singaporean pastor in Hong Kong for six years, came to EAST because he knew he had entered “the last lap of my race.” “To finish well,” he said, “I must prepare well.” A year into his MDiv program, David already experienced refreshment of vision through going deep into God’s Word, and through the EAST community of mission-minded professors and classmates. Read the testimony of his life’s journey thus far here. For mature men and women who are followers of Christ, the middle and latter years can make an eternal difference by mentoring younger adults that God has placed in their lives. Read an article here as it relates to older women. View the “Run the Race to Win” video devotional by our founding faculty, Dr Rick Langston, who exhorted us to complete the race victoriously. To explore how you can be further equipped in the Word and in ministry skills for the second half of your life, contact EAST at eastinfo@east.edu.sg. Blurbs are originally provided by the books’ publishers/sellers and reproduced here for information only. Bob Buford, Halftime: Moving from Success to Significance, 20th Anniversary Edition, Zondervan, 2015. Are you ready to move into the second half of your life? Bob Buford believes the second half of your life can be better than the first. Much better. But first, you need time to figure out what you want to do with the rest of your life. Features of this newly updated and expanded 20th Anniversary edition include a foreword by Jim Collins, the bestselling author of Good to Great; new questions for reflection or discussion at the end of each chapter; brand new “halftime” stories of men and women enjoying a second half of significance; specific halftime assignments to guide readers into their second-half mission; an essay by Bob on “The Wisdom of Peter Drucker,” and links to outstanding resources. Bob Buford, Finishing Well: The Adventure of Life Beyond Halftime, Zondervan, 2011. Author Bob Buford called them “code breakers”. They are people age 40 and older who have pioneered the art of finishing well in these modern times, and who can teach us to do the same, starting today. Buford sought out 60 of these trailblazers—including Peter Drucker, Roger Staubach, Jim Collins, Ken Blanchard and Dallas Willard—and has recorded their lively conversations in these pages so that they can serve as “mentors in print” for all of us. Buford gives you a chance to sit at the feet of these pioneers and learn from them about Finishing Well so that you may shift into a far more fulfilling life now, no matter your age. A life of significance that will be a legacy for future generations too. David Roper, Teach Us To Number Our Days, Discovery House Publishers, 2008. Fifty is the new forty! Sixty is the new fifty! People are living longer and healthier lives–and in the process, many try desperately to stave off “middle age,” let alone “maturity” or “old age.” And yet the truth is that we are all getting older. David Roper knows the human heart, its joys and sorrows, its highs and lows, and he writes with understanding about the challenges of middle age and beyond. In Teach Us to Number Our Days, he gives ample evidence that God wastes nothing in our lives, not even our sins. He assures us that as we “come of age,” we are not winding down, but taking the next sure step into a full and useful life. As we do, we can become ever more useful to God and to others. Jean Fleming, Pursue the Intentional Life, NavPress, 2013. Do you ever wonder what your future holds? As ministry leader Jean Fleming began pondering how she could serve God with more purpose, she created Pursue the Intentional Life, a book that will help you discover how God’s promises and instructions contain just what you need for the unknown days ahead. Whether you are facing the end of something in your life, or embarking on a new beginning, this book will help you live meaningfully and intentionally in the present while preparing well for the future. Jean Fleming is an experienced ministry and Bible-study leader with The Navigators and author of A Mother’s Heart and Feeding Your Soul. David and Claudia Arp, Second Half of Marriage: Facing the Eight Challenges of the Empty-nest Years, Zondervan, 1998. Your children are gone or leaving soon. It’s time to focus once again on your own future and especially on your marriage. What’s in store for the second half? David and Claudia Arp provide answers and practical help in this groundbreaking book. Drawing on their national survey of hundreds of “second-half” couples, the Arps reveal eight marital challenges every long-term marriage faces, and they offer strategies and exercises for meeting each of them. The Second Half of Marriage will challenge you to create a vision for the rest of your life together — and inspire you to make that vision a reality. Patrick Morley, Second Half For The Man In The Mirror: How to Find God’s Will For the Rest of Your Journey, Zondervan, 2002. The first part of your life was like a river running swiftly within its banks. You were working hard to make your mark. You were intense. Focused. Then your river broadened into a lake. Now you find it hard to focus. Often, instead of feeling drive and purpose, you feel distracted–even insignificant. Patrick Morley shows how this season of perplexity can become a man’s golden opportunity to ‘reinvent’ himself for life’s second half. If this sounds like you–or someone you know and love–this book is exactly what you’re looking for. Morley gives biblical insights, lived out in the crucible of his own life experience. This book will help you redefine your vision, your goals, and the heart that drives them. Second Half for the Man in the Mirror will help you find a fresh sense of authenticity. Once again, you’ll feel your life regaining speed as the waters are gathered by the converging riverbanks just ahead. Billy Graham, Nearing Home: Life, Faith, and Finishing Well, PVM Harvest, 2013. Karen O’Connor, My Senior Moments Have Gone High-Tech: Laugh-Out-Loud Stories to Calm Your E-Fears, Harvest House, 2016.
looked for the “any” key after being instructed to “press any key”? kicked up a fuss when the printer didn’t work…only to find it wasn’t plugged in? talked into the TV remote because you thought it was your cell phone? You’re not alone! With plenty of encouragement and simple tips for navigating new technology, My Senior Moments Have Gone High-Tech will bolster your confidence. You can successfully tackle today’s gizmos to keep in close touch with your friends and family–and especially your grandkids.